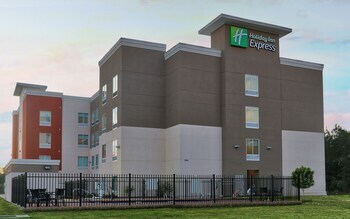 Save by pairing your accommodations and airfares. Expedia has some epic New Orleans holiday packages that'll simplify things and give you more money to spend! Smart jetsetters can gain savings of up to 15%* by securing a combined package deal on Expedia. Look through our intercontinental database of more than 400 partner airlines and 321,000 properties worldwide. Too many to choose from? Don't stress — we can help you decide! If you have to change your travel plans, we will honour your cancellation request on nearly all reservations with no hidden fees. There are loads of fantastic things you can do when you're in a new place. So why not get your trip to New Orleans off to a sensational start by perusing some of our top tips? After all – out there starts here! You're going to find yourself surrounded by notable things to see and do, like the New Orleans Museum of Art and French Market. If you really want to make the most of your time here, also consider visiting Jackson Square and Audubon Park. Over the years, countless great minds and visionaries have studied within the lecture rooms of Tulane University. Learn about its history and achievements, and stroll its stately campus on a guided tour. Adventurers in this destination have an abundance of choice. Do you have an inquisitive mind? Love knowing how things are put together? Take a tour through Mardi Gras World and see for yourself what goes into making their products from start to finish. Still got time on your hands? History has many lessons to teach us. Soak up the knowledge and learn from the past at National World War II Museum. Ready to make some incredible memories? A trip away is the perfect time to jump into thrilling new experiences. Got some time up your sleeve? Head to our New Orleans things to do page for a complete list of activities. 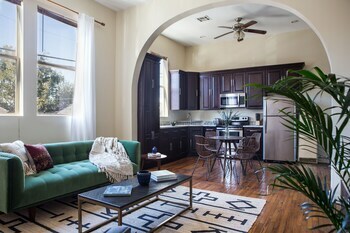 With no less than 193 properties in New Orleans, searching for a place to lay your head won't be difficult. But why wait any longer? Book now via Expedia and kick-start your next cheap holiday or luxury getaway. 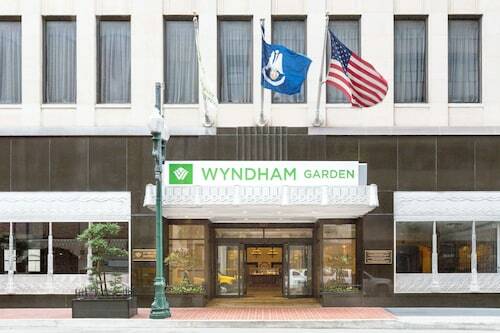 Begin the search for an upmarket New Orleans base by investigating the latest deals at the Windsor Court Hotel (300 Gravier St) and The Ritz-Carlton, New Orleans (921 Canal St). If your holiday fund is a little lower than you thought it would be, the Jean Lafitte House (613 Esplanade Ave) and the French Quarter Suites Hotel (1119 North Rampart Street) are a couple of lower-priced options. The airport probably won't be the most entertaining part of your holiday, but there's nothing like the excitement of knowing that your well-deserved trip to New Orleans is just a plane ride away! 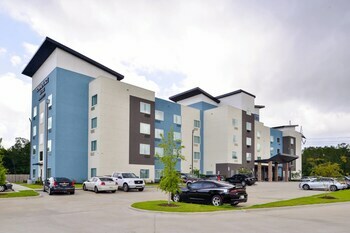 Once you disembark at Louis Armstrong New Orleans International Airport (MSY), you'll be 11 miles (18 km) from the heart of town. Chill out Southern-style in this freewheeling park with a fascinating past. The oldest church in Louisiana is one of New Orleans’ best loved landmarks. A rare collection of artefacts, memorabilia and documents piece together the story of America’s involvement in the Second World War. Party with the locals in the jazz clubs and cafes of this hip New Orleans avenue. See how the floats for New Orleans’ world-famous annual fiesta are put together in this museum with a difference. Discover the cultural heritage of Louisiana alongside masterpieces from the major names in world art. Step back in time at this atmospheric testament to New Orleans’ long and diverse history. The Cities of the Dead, famous for their above-ground tombs and mausoleums, are the final resting places of celebrated New Orleans residents. Fascinating insights into the history of Louisiana and its people await at this museum filled with unusual artifacts. Bask in a beautiful and historic green space that is also home to several major attractions, including a zoo, a golf course and stables. Louisiana’s historic zoo has been introducing the wonders of the animal kingdom to eager visitors for over a century. Interesting hands-on learning experiences are just one part of this wonderfully well-equipped aquarium, home to around 15,000 different fascinating creatures. One of the oldest museums in Louisiana explores Civil War history via the second-largest collection of Confederate artifacts in the world. Fascinating insects creep, crawl and flutter all around the extensive displays at this living museum, which promises a magical day out for adults and kids alike. The engaging museum housed in this historic building offers insight into everything from New Orleans Jazz to local arts and crafts. Visit two exhibitions devoted to two very different angles of Louisiana’s past and present, both housed in a remarkable building with a rich history. Start your exploration of New Orleans with the many attractions on this buzzing pedestrianized street, which is located right in the heart of the downtown area. The birthplace of jazz is a vibrant city boulevard where the history and music of New Orleans comes to life. 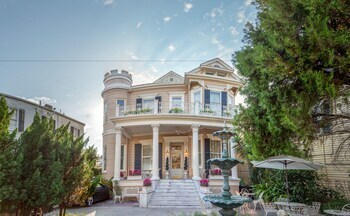 Wander colorful gardens dotted with fountains and experience the lavish lifestyle of a wealthy early 20th-century New Orleans family at this historic attraction. 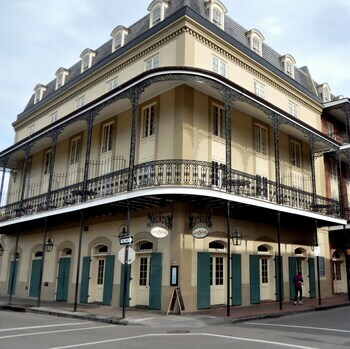 Located in French Quarter, this historic hotel is within a 5-minute walk of Bourbon Street, Royal Street, and Preservation Hall. Canal Street and Jackson Square are also within 10 minutes. New Orleans Union Passenger Terminal is 26 minutes by foot. 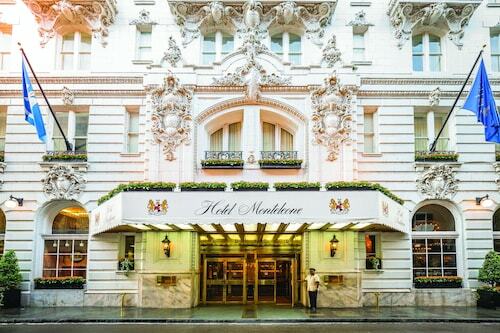 Located in Central Business District, this historic hotel is within a 5-minute walk of Canal Street and Bourbon Street. Royal Street and Saenger Theatre are also within 10 minutes. New Orleans Union Passenger Terminal is 17 minutes by foot. 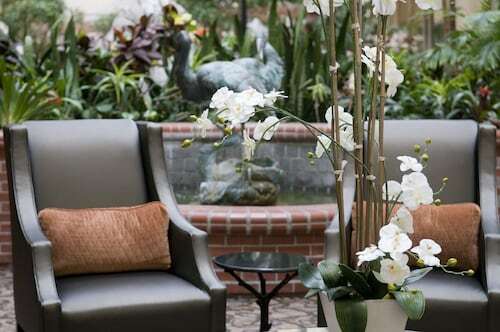 Located in French Quarter, this luxury hotel is within a 10-minute walk of Bourbon Street and Jackson Square. French Market and National World War II Museum are also within 1 mi (2 km). New Orleans Union Passenger Terminal is 23 minutes by foot. 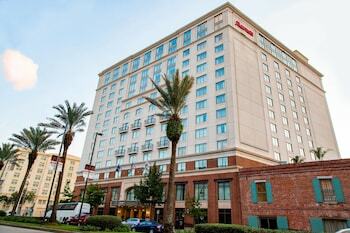 Located in French Quarter, this hotel is steps away from Canal Street, Bourbon Street and Royal Street. Decatur Street and Audubon Insectarium are also within 5 minutes. New Orleans Union Passenger Terminal is 20 minutes by foot. 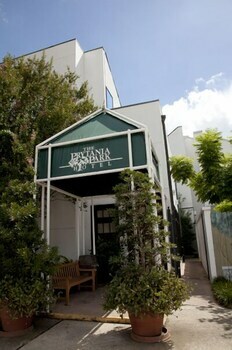 Located in French Quarter, this spa hotel is within a 10-minute walk of Bourbon Street and Jackson Square. French Market and National World War II Museum are also within 1 mi (2 km). New Orleans Union Passenger Terminal is 23 minutes by foot. 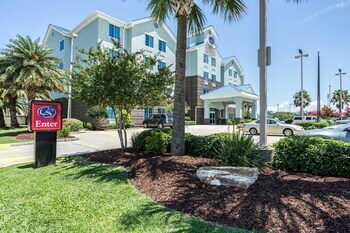 Situated on the riverfront, this hotel is 3.1 mi (4.9 km) from Audubon Zoo, and within 6 mi (10 km) of Lakeside Shopping Center and New Orleans Museum of Art. Mercedes-Benz Superdome and Ernest N. Morial Convention Center are also within 9 mi (15 km). 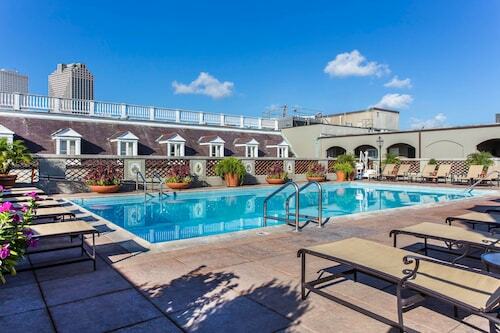 This family-friendly New Orleans hotel is located in the historical district, within a 5-minute walk of Bourbon Street, Preservation Hall and Jackson Square. Cafe Du Monde and The Shops at Canal Place are also within 10 minutes. New Orleans Union Passenger Terminal is 27 minutes by foot. Glasgow Intl. - Louis Armstrong New Orleans Intl. LON-All Airports - Louis Armstrong New Orleans Intl. Heathrow - Louis Armstrong New Orleans Intl.